I've completed the first review of the references in Sea Urchin . They are heavily biased toward thyroid hormones. I don't know if this reflects an early evolution of thyroid hormones or just an early interest in them. "Sea urchins or urchins (/ˈɜːrtʃɪnz/), archaically called sea hedgehogs, are small, spiny, globular animals that, with their close kin, such as sand dollars, constitute the class Echinoidea of the echinoderm phylum. About 950 species of echinoids inhabit all oceans from the intertidal to 5,000 metres (16,000 ft; 2,700 fathoms) deep. The shell, or "test", of sea urchins is round and spiny, typically from 3 to 10 cm (1.2 to 3.9 in) across. Common colors include black and dull shades of green, olive, brown, purple, blue, and red. Sea urchins move slowly, feeding primarily on algae. Sea otters, starfish, wolf eels, triggerfish, and other predators hunt and feed on sea urchins. Their roe is a delicacy in many cuisines. 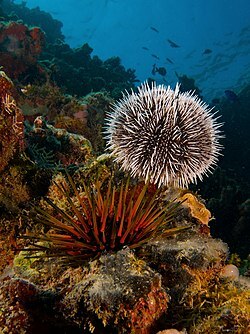 The name "urchin" is an old word for hedgehog, which sea urchins resemble." two species of tropical sea urchins. Insulin receptor sites as membrane markers during embryonic development. I. Data obtained with unfertilized and fertilized sea urchin eggs. A low molecular weight factor from sea urchin eggs elevates sperm cyclic nucleotide concentrations and respiration rates. A sea urchin gene encodes a polypeptide homologous to epidermal growth factor. Molecular basis of signalling in the spermatozoon. SpCOUP-TF: a sea urchin member of the steroid/thyroid hormone receptor family. Effect of estrogen upon cyclic ADP ribose metabolism: beta-estradiol stimulates ADP ribosyl cyclase in rat uterus. Induction of metamorphosis in the sand dollar Peronella japonica by thyroid hormones. Ascidian homologs of mammalian thyroid peroxidase genes are expressed in the thyroid-equivalent region of the endostyle. Thyroid hormones and metamorphosis of sea urchin larvae. Heterochronic developmental shift caused by thyroid hormone in larval sand dollars and its implications for phenotypic plasticity and the evolution of nonfeeding development. Thyroid hormones determine developmental mode in sand dollars (Echinodermata: Echinoidea). Left-right asymmetry in the sea urchin embryo is regulated by nodal signaling on the right side. Triphenyltin alters androgen metabolism in the sea urchin Paracentrotus lividus. Endogenous thyroid hormone synthesis in facultative planktotrophic larvae of the sand dollar Clypeaster rosaceus: implications for the evolutionary loss of larval feeding. Thyroid hormone metabolism and peroxidase function in two non-chordate animals. A genomic view of the sea urchin nervous system. "The neurobiology of sea urchins is of particular interest because they have a close phylogenetic relationship with chordates, yet a distinctive pentaradiate body plan and unusual neural organization." " A family of genes encoding voltage-gated ion channels is present but, surprisingly, genes encoding gap junction proteins (connexins and pannexins) appear to be absent. Genes required for synapse formation and function have been identified and genes for synthesis and transport of neurotransmitters are present. There is a large family of G-protein-coupled receptors, including 874 rhodopsin-type receptors, 28 metabotropic glutamate-like receptors and a remarkably expanded group of 161 secretin receptor-like proteins." "There are at least 37 putative G-protein-coupled peptide receptors and precursors for several neuropeptides and peptide hormones have been identified, including ... a vasotocin-like peptide, glycoprotein hormones, and insulin/insulin-like growth factors. Identification of a neurotrophin-like gene and Trk receptor in sea urchin indicates that this neural signaling system is not unique to chordates. Several hundred chemoreceptor genes have been predicted using several approaches, a number similar to that for other animals." There's quite a lot here about hormones as well as neurotransmitters, but no mention of steroids. Gametogenesis correlated with steroid levels during the gonadal cycle of the sea urchin Paracentrotus lividus (Echinodermata: Echinoidea). Effects of 17beta-estradiol, and its metabolite, 4-hydroxyestradiol on fertilization, embryo development and oxidative DNA damage in sand dollar (Dendraster excentricus) sperm. Endocrine interactions between plants and animals: Implications of exogenous hormone sources for the evolution of hormone signaling. Evolution of 11beta-hydroxysteroid dehydrogenase-type 1 and 11beta-hydroxysteroid dehydrogenase-type 3. Neuropeptides and polypeptide hormones in echinoderms: new insights from analysis of the transcriptome of the sea cucumber Apostichopus japonicus. Characterization of insulin-like peptides (ILPs) in the sea urchin Strongylocentrotus purpuratus: insights on the evolution of the insulin family. Evolution of gonadotropin-inhibitory hormone receptor and its ligand. Unraveling estradiol metabolism and involvement in the reproductive cycle of non-vertebrate animals: The sea urchin model.